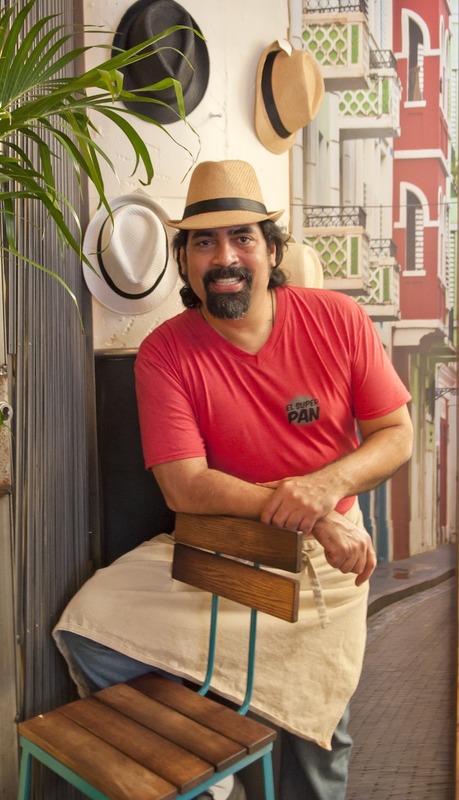 Home Restaurants What’s the craziest thing El Super Pan’s Hector Santiago has ever butchered? What’s the craziest thing El Super Pan’s Hector Santiago has ever butchered? 13 Questions is a weekly series where we ask chefs 13 questions to get to know them outside of the kitchen. Hector Santiago is chef at El Super Pan. You went to the Culinary Institute of America. Is it worth it? Any school is worth it to learn, but so many people go to culinary school and aren’t interested in learning how to be a cook. They’re teaching people how to be chefs but not how to be cooks. [The students] have no idea how to slice, dice, add salt to dish at a proper time. I think school needs to be the restaurant; I tell my guys don’t go because I’ll teach you everything I know, and what I don’t I’ll direct you to someone. What is your snack food guilty pleasure? I love Spam. I love frying it with rice and an egg. When you aren’t cooking, what do you do in your free time? I go traveling. The first thing I need to have is a car on my hands so I can go explore, so I initially try to explore ahead on Google Maps. I spend a lot of time on Google Maps “driving” the roads. The last place I went to was Belize. That was a cool trip because the food ended up being similar to the cuisine we cook. What was the last TV you show bingewatched? What’s your favorite country to visit in Latin America? Peru. I love the food and the culinary scene. The second time I went was for Mistura, a food and wine festival. It encompasses everyone from the growers to the people who cook food on the street to the chefs at restaurants. Everything is under one roof, and they really do it well. I’ve been twice to the festival. It’s the culinary force that really put Peru on the map. What’s one ingredient you can’t stand? It’s a seafood from Chile called pyura. It grows in low shallow water by sea, and when you crack it open, it’s like an egg. When you open it, it looks like a peeled tomato, but it tastes like pure iodine. The first time I had it in Chile, I almost passed out. But I had it in an empanada, and it was damn good. What was the weirdest thing about being on Top Chef? Just being on Top Chef. To me it was cool. It brought some recognition to the restaurant [Santiago ran Pura Vida then]. The first time they called me, I was like, “Hell, no. I don’t want to do that.” The second time they called me, I looked around the restaurant, and we were less busy, so I said yes. It worked out well for the restaurant, not as much for me. But I don’t care about being on Top Chef; I want recognition from my peers. I am more proud of the James Beard nominations than anything else. What’s the craziest thing you’ve ever butchered? I [butchered and] ate a guinea pig in Peru. The guinea pig looked at me and de-manned me—he almost smiled at me. Then they told me to hit it, and I kept hitting it and hearing squeaks. They said, “No, harder!” Then I hit it enough that it was stoned, and then I cut it. But it was delicious, almost like eating rabbit. What do you miss most about Puerto Rico? My family and friends. A lot of my family is still there. My friends, once we all grew up, a third to half of us left the island, but we still have a very strong group of friends in Puerto Rico that still hangs out together. Every time we go back home, those are our people. I go once a year. My life here, I do have a lot of friends, but it’s more about work. There, it’s about embracing the friends. Beer or cocktails. IPAs a lot lately. I try to buy local stuff: SweetWater, Tropácalia, Second Self, I love the Red Hop Rye and Mole Porter. Usually, I have a beer after work. And I love Negronis. I love how much you can play with it and still get a great product. My biggest in the kitchen is standing around. I say we don’t want a flamingo. Flamingos are beautiful birds, but don’t be one. Come to work on time and willing and ready to work. I am a workaholic, and I want people to work how I work. What have you learned switching from sit-down restaurants to farmers markets to a food stall? I love them all. My goal is on the bigger picture: I want a multilayer business, food truck, food stall, casual restaurant that is sit down or to-go. Food is culture, and I want to be able to bring all that—all those flavors and all those ingredients—and sometimes you can create one dish that translates to all cultures. What we do in the sandwich shop is as complex as a fine dining dish. It’s all the same mentality, but the presentation and atmosphere is different. The flavors are the same. I always say I just want to eat froie gras in my underwear, not literally, but I shouldn’t need to put on a tuxedo. It’s food—you should be enjoying it; don’t get snobby about it. You’ve cooked in New York City, D.C., etc. What made you move to Atlanta? I was in New York before I moved to Atlanta. I got tired of the weather, and I wanted to move down. And my wife always wanted to move for the milder weather. We came down here before the Olympics. There were a lot of restaurants opening and a lot of job offers. It was a great time to be here, and from then we never looked back. Also, the whole transformation to a local economy when it comes to food is amazing, and I feel like I’ve been part of it. It used to be there was just Your DeKalb Farmers Market, which is great, but now there are actual farmers markets. I used to have one farmer, who didn’t even have everything, and now I have too many. And I love how international it’s become. There are so many Latin Americans. Coming from New York, it didn’t feel that way. I really fell in love with Latin America when I lived in New York, ironically. Once I got to New York, it was like we’re all immigrants now, and I’m not Puerto Rican, I’m Latin American. And now I’m feeling that here.